What makes a bike useful? If you can ride on wet pavement and not get wet; if you can ride at night and be seen; if you can ride with two bags of groceries, your bike is useful. If it is an analogue for a car, then it is useful. If you can ride it to and from work or out to dinner. If you can take your kids on it. If you can go shopping. 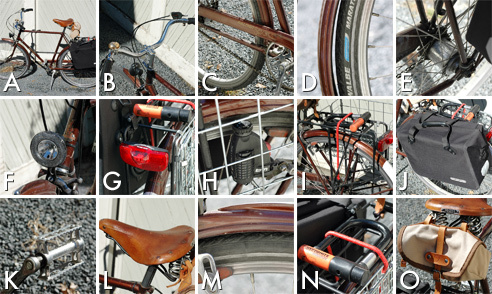 This is a blog about what makes a useful bike. I hope in this space to write what I know about bikes and what I learn while I ride them most every day. I’ve never been a mechanic and I don’t have a deep practical bicycle knowledge, but I’ve been riding long enough and often enough that I’ve found what I think works and what doesn’t. This is my city bike, the bike I use for commuting. 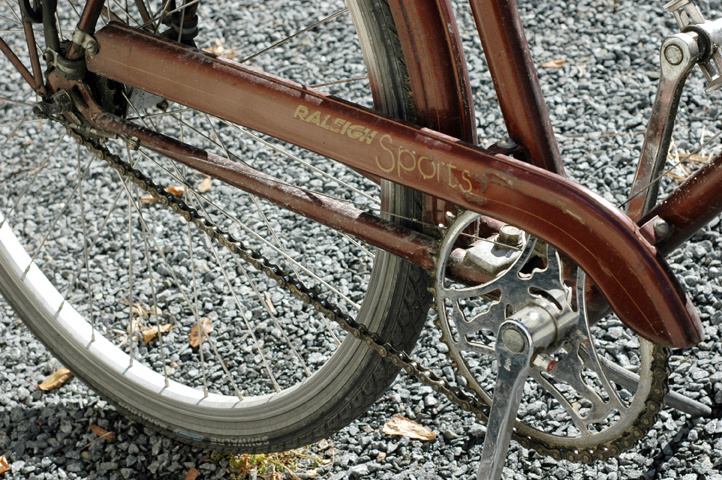 It’s a ’77 3-speed Raleigh Sports to which I’ve done a fair amount of tinkering over the years. 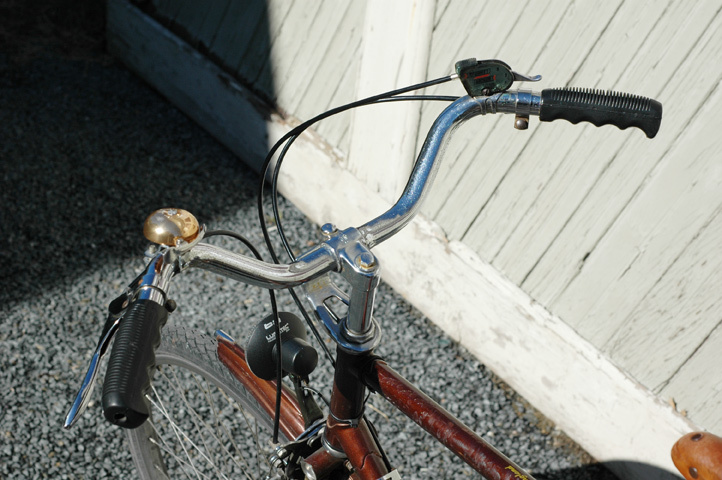 Older model bicycles like this were made to last but still need a little help to be fully modern and practical. Here are fifteen things about it which I think make it useful. When racing took a singular hold on bicycle manufacturing, weight became the only measure of a frame’s worth. I am sometimes asked how much my bike weighs, the subtext of which is: how can you possibly get around on that tank? The answer is I do it casually because weight isn’t much of a concern to me. Unless you race bikes for a living, frame weight shouldn’t matter to you, either. 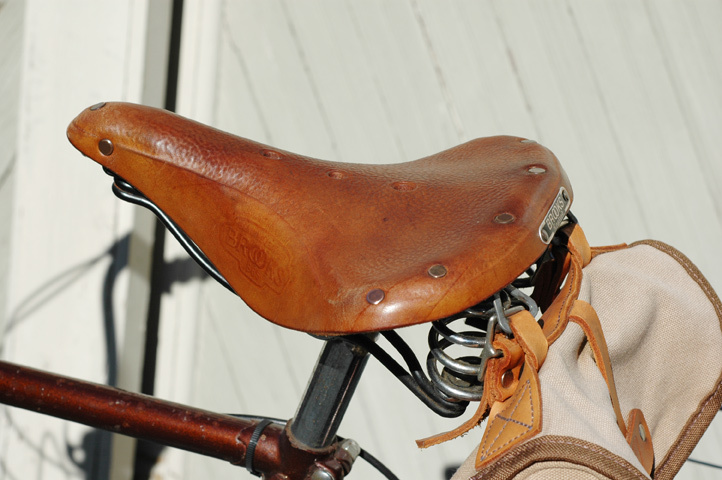 When I talk about a useful bike, I necessarily mean a bike that will last a lifetime. Every pound of weight savings off a frame is a trade against durability and longevity. The lightest frame materials are the least durable. If you crack your $5000 carbon fiber frame, you will have to find an expensive, specialized repair shop and hope the damage is minimal. If you bend or crack a steel tube, you can bring it to any frame builder or welder and be back on the road for a few hundred bucks. Another shortcoming of the weight obsession is a frame in this context is always considered without its rider. If you are comparing two frames, one which weighs 10 pounds and one which weighs 20, the salesman will tell you the 10-pound frame weighs 50% less. But this is a fallacy in the real world because you aren’t considering your own weight on the bike. Assume you weigh 200 pounds. Now you are comparing a cycling setup weighing 210 lbs vs. one weighing 220 lbs, which at this point is a 5% weight differential. Is a 5% lighter bike worth the cost of replacing it 10 or 15 years sooner than the heavier model? Nearly every bike for sale in America today has a threadless headset. It was a development which allowed manufacturers to use one fork on many bikes which had previously required individual forks. Costs went down, but riders lost a lot of flexibility. A threadless stem cannot be adjusted significantly once installed and nearly every one of them is installed at a height optimal for speed, so the rider is hunched over. Fortunately, a few manufacturers stick with the threaded headset and quill stem, which lets you raise and lower your bars with ease and over a range of many inches, but most importantly gets the bars high enough for an upright sitting posture. Bikes made before the late 80s will have this setup. Sitting upright is your key to comfort, being able to see the traffic around you and enjoying the view. A useful bike is a bike which can be ridden in whatever you’re wearing. That means if your pant legs go down to your shoes, they should stay there. 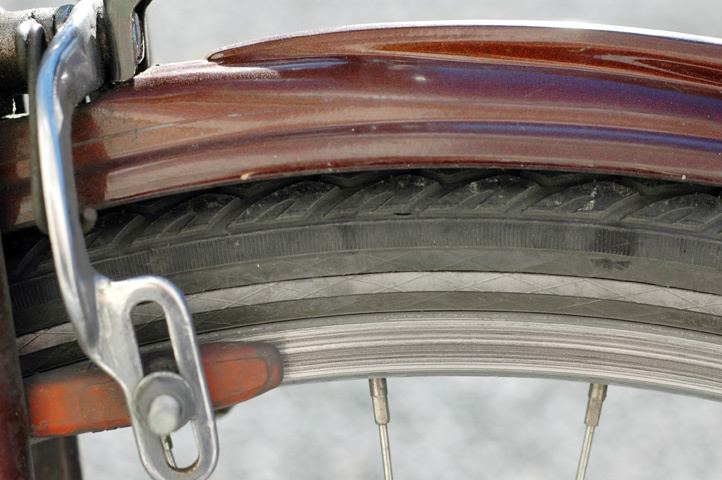 If you have to roll them up or tie them back, then your bike is not the useful it could be. You can’t do this without a chainguard or a chaincase. Fenders are second only to lights. You practically couldn’t even get a bike without fenders up until the point at which racing stripped everything useful off them. Fenders keep you dry. They keep the spray from a wet road out of your face and off your back (and out of the face of the rider behind you). SKS makes a great set out of recycled plastic. You also have fancy options. Just don’t get the kind that clip on to your seat post. Get full fenders. Gearing is another perennial bike conversation. 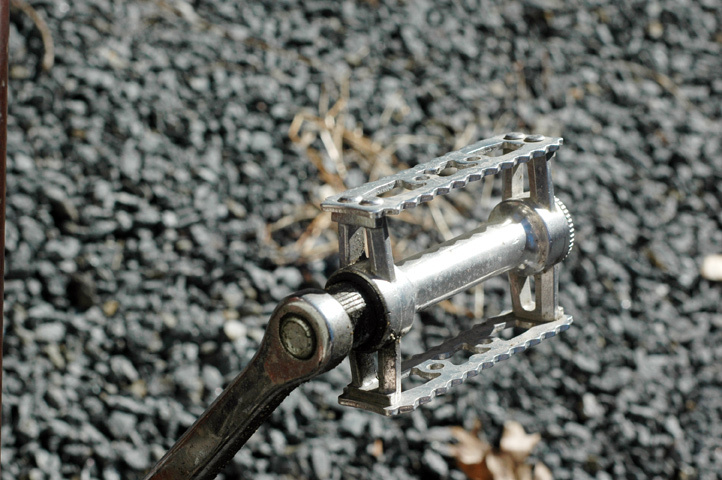 It’s the sister sales tool to frame weight—more gears equals more better. Gears are lovely on the open road, on club rides or touring, but around town when you’re maxing out at 12mph, nobody needs more than eight. My Raleigh only has three and 95% of the time that’s all I need. One is pretty tough unless you really want to work. When you have that few gears, you can package them inside a hub and shield them from inclimate weather and dirt. You no longer need a deraileur, so your chain becomes fixed and will never have the opportunity to jump off your rings and leave you with greasy hands at the side of the road (if you have a bike with a deraileur, this has happened to you, I guarantee it). This is the beauty of the internally-geared hub. It renders your drivetrain maintenance-free. 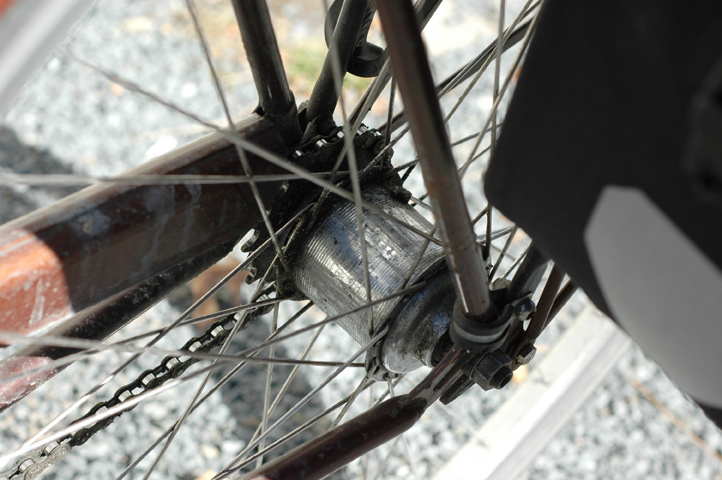 I do nothing but squeeze a couple drops of oil into my Sturmey Archer when I remember to and it has never, ever failed. My bike is 33 years old. 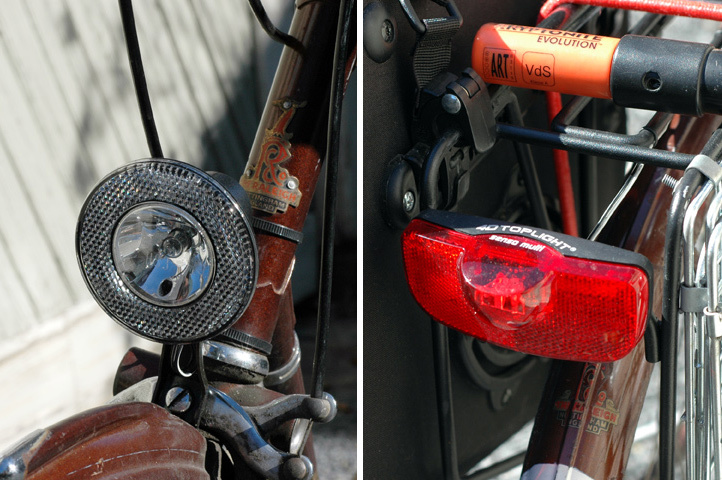 Lights are the single most important component on your bike. Spend extra on them. I ride through the winter, which means most mornings and every evening I need lights. My head lamp has saved me from more accidents than I can count. I don’t think blinkies in back are great, but definitely don’t use one up front. People crossing from side streets will not see you if you aren’t shining steady in their face. Go with a big, solid tail light. I swear, drivers will give you a wider berth if they think you are riding a scooter or a small motorcycle. Make sure it’s mounted on a rack or a seat stay. 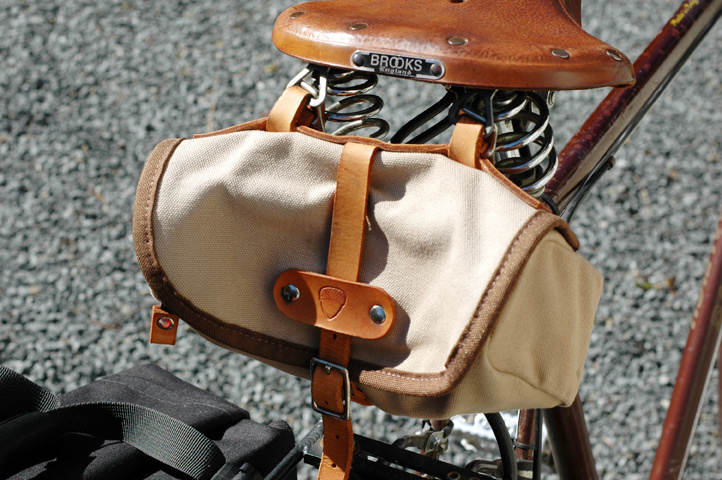 I see people all the time with blinkies clipped on shoulder bags where the light is mostly covered by the bag flap and the rider doesn’t know it. I only recently made the move to generator-driven lights. You can get great quality battery-powered lights but you’ll eventually be cursing on a narrow shoulder because your head lamp died and you don’t have spare batteries anywhere. Peter White is fond of saying the difference between a toy bicycle and an adult bicycle is generator-powered lights (I’m paraphrasing here). He’ll then ask whether you would get into a car at night without automatic lights and if not, why would you do that on your bicycle? Bottle generators are vastly better than they used to be. Setting one up with lights on an older bike like this is easy and relatively inexpensive, considering the benefits. My lights and generator are Busch & Müller and cost about $150 altogether. They are reliable and made to stay outside all the time. 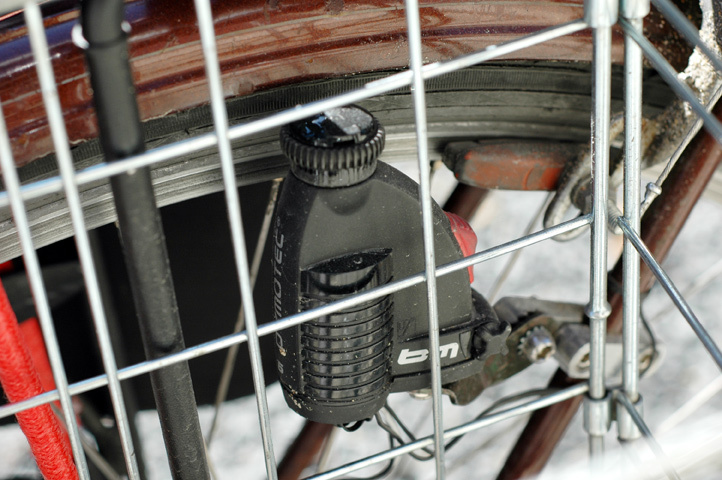 On new bikes, look for the Shimano hub generator. 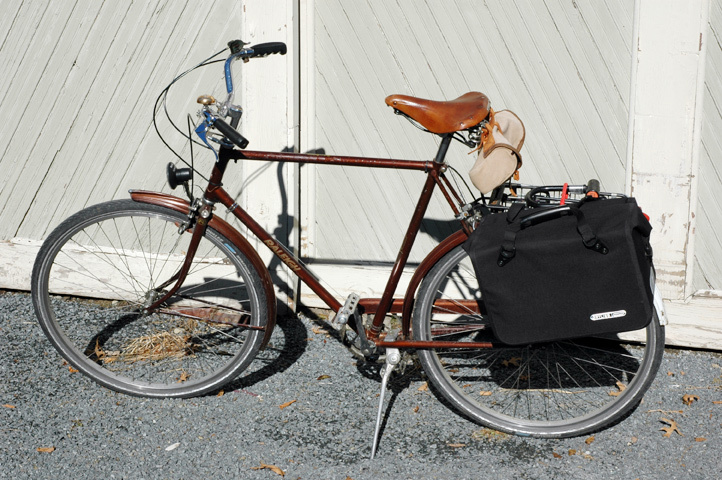 A bike isn’t practical if it can’t carry anything other than you, so get a rack or a basket up front. Sure, you can sling a bag over your back, but riding unencumbered is just about a thousand times more pleasant. A frame with rack eyelets is best because the rack will mount to them and never move. My bike doesn’t have them, so I have to clamp it to the seat stays. It’s not ideal and it wobbles under heavy loads, but it gets the job done. 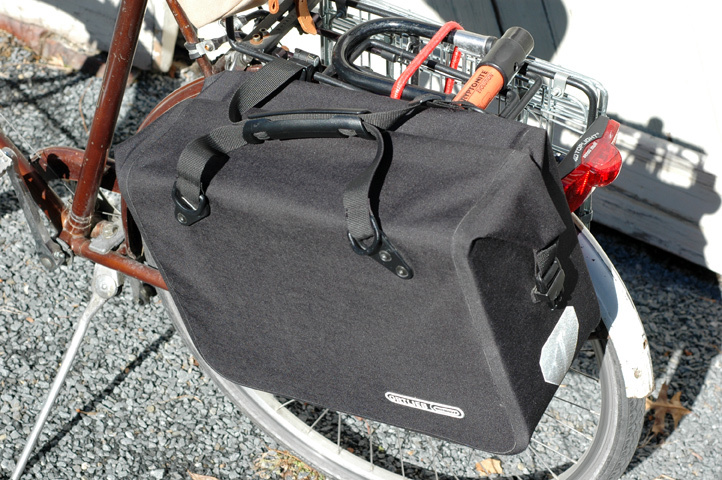 On one side I have a fold-up Wald basket (very handy for beer) and the other side I keep free for an Ortleib pannier. It clips on and off in half a second, has a roll top so is completely waterproof, and has a handle and feet so you can carry it and set it down without it flopping over. It is black and boring. Ditch the rubber bricks that come standard on these old bikes and spend 20 bucks on a pair of MKS rat traps like these. Even if you never ride in the rain, you will one day ride the day after the rain and your wet soles will skid right off those toothless blocks and you will lose control just a little bit. And you won’t like it. Don’t let anyone rope you into a conversation about how well a particular frame material rides. It’s a mostly ridiculous concept, but someone somewhere will try to convince you that titanium is way less harsh than aluminum. Doesn’t matter. All you need are wide tires—38mm and up, but not knobby—and a sprung saddle. That’s your suspension. Not all tires are the same, like most everything. Cheap tires will wear more quickly, so if you commute every day, spend the money on a pair of Schwalbes or something comparable. Schwalbes are great because they build in two features especially for the practical cyclist: a reflective stripe on both sides which screams when headlights hit it (the grey band above the brake) and a ridged band for a bottle dynamo to grip (you can see it in the enlarged photo). I use both. Conventional wisdom says a thief will steal the bike which is easiest to take, so as long as your lock is better than the bike next to yours, you’ll be fine. Every neighborhood is different. I never carried anything less than a 15-pound hardened chain when I locked up in New York, but your local criminals may be gentler. 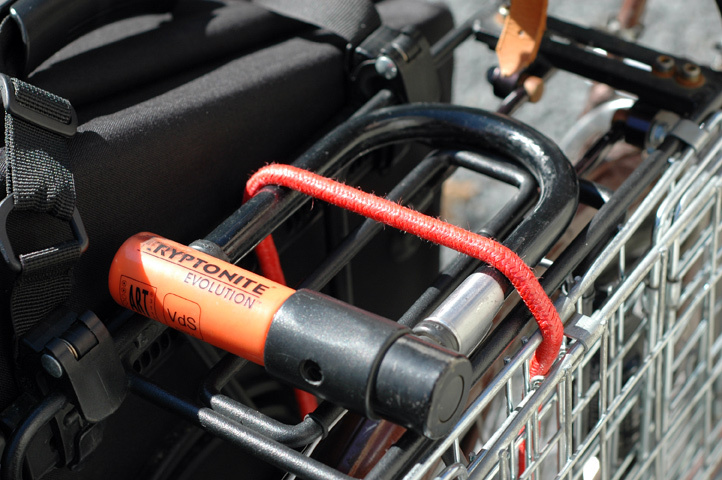 A quality U-lock is plenty in most places. The smaller ones are better because they give a thief less opportunity for leverage when attempting to break it. 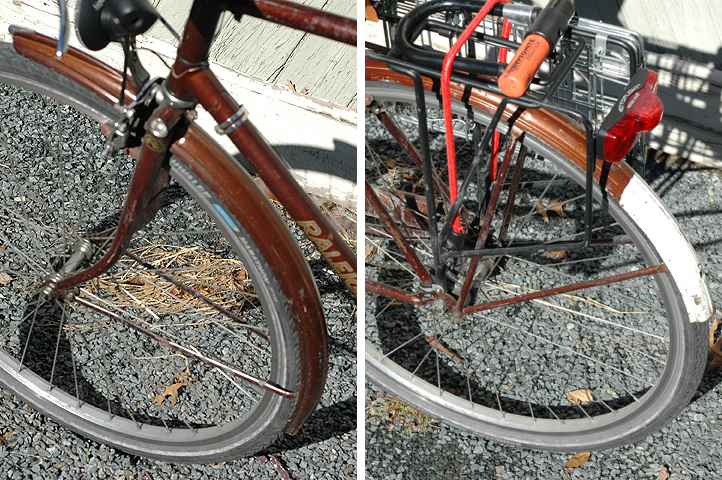 Just don’t ever use a twisted-strand cable lock. They can be cut with a good pair of kitchen shears. Totally fascinating. I recently got a used bike – as you may well know – and I made pretty much every rookie mistake you’ve described here. As far as gears & frame go, do you think the terrain makes a difference? I know suckas love they fixies, but I can’t imagine handling some of the hills around me without gears. Although, I could probably do the job with just 3 … I’m either all the way high, all the way low, or right in the middle. Also, are you ever carrying your bike up and down stairs? I could care less about the weight of the frame when I’m on the road, but it definitely makes a difference when I’m lifting it over my shoulder 8 times a day. Terrain definitely makes a difference with gearing, not so much the frame. I put a bigger cog on my Raleigh to lower my whole range because there are enough hills around here that its gearing was too high for 1st to be practical. I didn’t mean to imply that gears are worthless—I certainly couldn’t get around on a fixie; more power to the hipsters there—but the complexity of having 30 gear options on a single bike is overkill for city riding. As you pointed out, you don’t ever use all those gears in between. As long as the low end gets you up your hills, everything else is secondary. If I had a higher option, I probably wouldn’t ever use it because at that speed, I’m coasting. I’m not ever carrying my bike upstairs—you make a good point. That’s the one spot where weight can be a pain. I was going to put in a line about excepting people on a 5th floor walkup, but I have another post in the works about finding ways to not carry your bike. One point I want to make though, is that not everyone out there riding is a commuter, and the balance of people out there are not “racers.” As a matter of fact, outside of cities, I would think most folks on bikes might not fit into either category. I ride bikes because its fun. That said, I like my carbon road bike, because I like the way it feels on the road. I can ride 75 miles on it without feeling shell shocked. Its lighter than steel too, less durable -and yeah, that’s a sacrifice I’m willing to make. I like my all mountain bike a little bit light, because I like the way a lighter bike feels. I have a single speed too – its lighter than bejezuz, and I’ve ridden it down some pretty nasty things, and somehow it survives. So leave a little room for us in your bike analysis too, even though we probably not your intended audience. Some of us just like to ride, and are looking for the ride that will leave us at the trailhead or parking lot with a biggest smile across our maws. Josh! When are we all going to meet up in Vegas already? We need to hang out more than once every three years. Riding bikes because they’re fun is one of the best things in the world, totally agreed! I don’t mean to denegrate any other riding styles with what I’m putting down here. I love club rides and overnights. I hope my take on commuting and practicality doesn’t come off as if it’s the ONE TRUE WAY. That’s not my intent, so please call me out on it if it veers off course. Rather, I want to narrow my focus and point out what elements of recreational cycling don’t work terribly well for daily riding. Making sacrifices in the other direction is totally fine, but I want people to understand what they are when they go to choose a bike. I will definitely leave a little analysis for those other styles; I’m sure I’ll have stories come spring when I get back out on my road bike. And to your point about the balance of people out there not being racers: that’s exactly what I’m getting at in my introduction. Most people aren’t racers and yet they end up with bikes made for racing. I’ll be going into more detail on that subject in a later post. Good luck with the drunken race! Agreed, We should high five sometime soon! I don’t disagree with you on any of this stuff, I was just thinking it needed a little of a caveat. Now, chamois cream, that would be a good point of discussion.